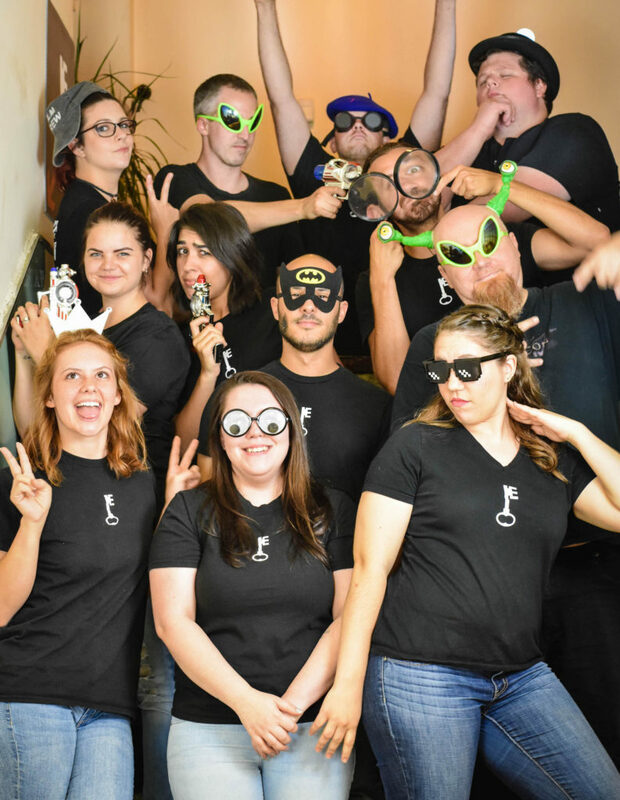 We’re a small team of energetic, creative people who like puzzles, games, and New Haven. 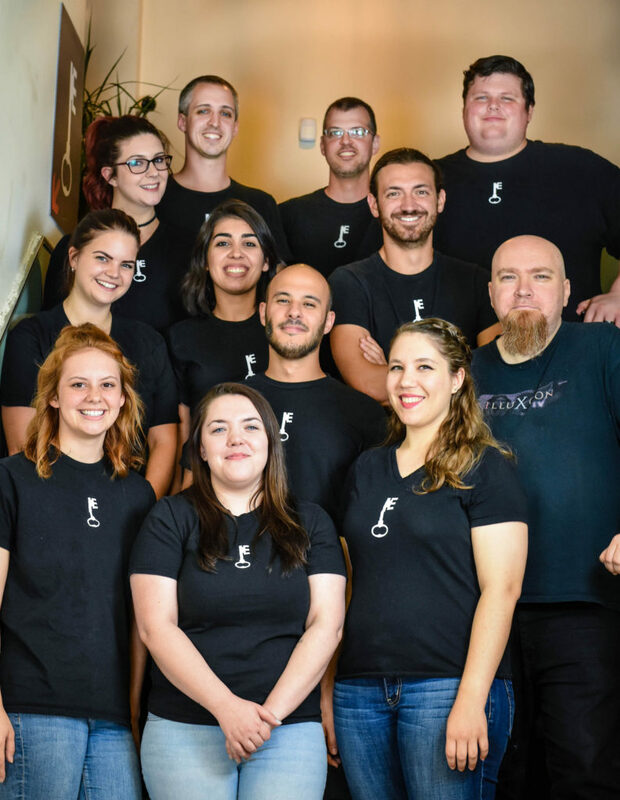 Learn about our staff of game masters, engineers, and designers! In the daytime, Angela works as the Development Coordinator for Long Wharf Theatre. Originally from Buffalo, NY, she holds a degree in Arts Administration & Theatre. Angela is excited to apply her love of horror movies, all things nerdy, and immersive theatrical experiences to set the scene for your escape. Ariel’s home state is sunny New Mexico, where she graduated with an MBA in Marketing and Operations Management from UNM. After New Mexico, Ariel spent a few years in Massachusetts managing the floral program for a variety of small stores before moving to Connecticut in early 2018. Cole is from San Antonio, TX, and holds a Bachelor’s Degree in Anthropology. She is excited to be part of the ENH Team, where her love of puzzles, mysteries and gaming come together. Outside of work, Cole can be spotted doing aerial arts, camping, playing video games on the easiest difficulty setting, reading mystery novels, and drinking tea. Outside of ENH, Dan performs stand-up comedy and is a managing editor at the satirical website thehardtimes.net. Elsbeth joined the ENH team in 2018 to manage our on-site group puzzle, Wreck Havoc. Originally from New Jersey, she holds an MFA in Acting from the Actors Studio Drama School. Outside of Escape, she can be found surrounded by several in-progress crafts and mugs of cold forgotten tea, with a cat on her lap, while binge-watching a show meant for teens in the early 2000s. Ethan grew up in Southbury, CT, and moved to New Haven in '08 to attend Yale. Since then, he has studied in China, worked in Zambia, bicycle-camped from coast to coast of the USA, and won/lost room escapes everywhere from Tennessee to Taiwan. Jeremy has a degree in mathematics from Brown University, and after years of corporate work set out for more creative pastures. He began building lamps, furniture, and clocks in 2012. Jeremy joined the ENH team in September 2017 as an engineer to help build and maintain our games. A lifelong love of games and gaming brings Joe to the Escape New Haven team. Outside of Escape, Joe is an accomplished sci-fi and fantasy illustrator who creates art for various games, including the massively popular Hearthstone by Blizzard Entertainment. Len is a man of mystery. His bio has been "forthcoming" for over two years now. Max studied mechanical engineering at Yale then spent several years designing biomedical devices. He now spends his days designing puzzles and challenges to confine, confound, confuse and amuse you. Max hopes you have as much fun solving his puzzles as he does making them. Literature enthusiast and lifelong Game Master, Mike is the most laid back Operator you’d like to meet. When not Operating or performing odd jobs, he can be found reading, writing, gaming, or all three at the same time! Dylan studied mathematics and business at Emory University and now spends his days investigating white-collar crime and other possible accounting mischiefs. A profound lover of all things games, Dylan’s first escape room challenge was an exhilarating, nail-biting experience. He is elated to be a part of Ethan and Max’s collaboration and knows they will continually push the boundaries of the Room Escape genre. Want to learn even more about what makes Escape New Haven the fun place you know and love? Check out our blog, or our YouTube channel!